Doctor Myron MacLain (erroneously named MacLean in this issue) explains that during World War II, he accidentally created a vibranium alloy for Captain America’s shield and was never able to duplicate its indestructible nature. The closest he came was when he invented adamantium, a virtually unbreakable metal. Lady Deathstrike, Yuriko, claims that the formula to bond adamantium to bone was invented by her father shortly after World War II in an attempt to create the ultimate Japanese warrior. The formula, however, was stolen by persons unknown, and was eventually used to bond adamantium to Logan’s skeleton during Experiment X. In a school paper for Sean Cassidy, Jubilee reports that Department H was responsible for bonding adamantium to Wolverine’s bones. There is, however, no details to back up this assertion. Professor Xavier and James Hudson theorize that Logan was chosen for Experiment X because his healing ability would allow him to survive the adamantium bonding procedure. They further note that the experiment probably halted a natural evolution within Logan that was turning him, gradually, more savage and bestial. Fantomax reveals Logan’s healing factor made him an ideal subject for vivisection and false memory grafts. As has been previously noted, the Marvel Press prose novel, Wolverine: Weapon X by Marc Cerasini, is a modern-day exploration of Barry Windsor-Smith’s Weapon X storyline. Marc Cerasini states in an interview with UnderGroundOnline that, “Mr. Windsor-Smith created the characters who forged Wolverine’s adamantium steel skeleton. 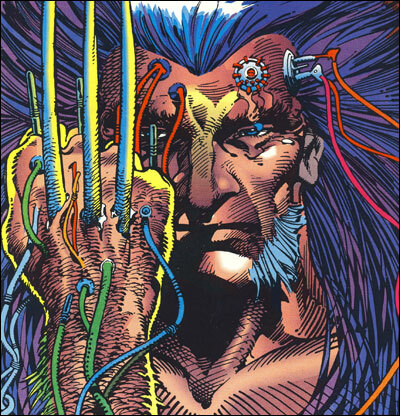 I explored the technology behind that transformation, and why it was done.” Due to significant problems with the novel’s chronology, including the deaths of major characters who survived Experiment X in the original Barry Windsor Smith version, I have deemed that Wolverine: Weapon X by Marc Cerasini does not take place within the traditional Marvel continuity. However, for the sake of completeness, I include several new pieces of information concerning Experiment X, published in red. Dr. Abraham B. Cornelius is revealed to be a pioneer in field of nanotechnology and its uses within the human body. After fleeing authorities on charges that he killed his wife and newborn son, Cornelius is recruited by the Professor to employ his nanotechnology in bonding adamantium to human bone without disrupting the natural life-sustaining functions of human marrow and bone. Over the course of six weeks, Logan is subjected to chemical treatments by a Dr. Hendry that increases his muscle mass by a third and reduces his body fat by more than a third. Transported to the Experiment X facility, Logan is shaved from head to toe, hooked up to a multitude of medical devices and submerged within medicinal liquids. With the use of numerous implants and feeding tubes, Dr. Cornelius, at the request of the Professor, begins injecting adamantium into Logan bonding this virtually unbreakable metal to his very bones. When Carol Hines realizes that Logan shows neither scarring from numerous gunshots wounds nor any abrasions from his earlier fight, Dr. Cornelius comes to the conclusion that Logan is a mutant with miraculous healing abilities, a trait that causes more adamantium to bond within Logan’s system that originally planned. After the reality-changing events of “House of M” come to a close, Logan finds that he remembers his entire past. Logan remembers being submerged in the medicinal liquids at the Experiment X facilities. Logan has a specific recollection of being submerged in the medicinal liquids at the Experiment X facilities where Dr. Cornelius asks Hines about Logan’s medical profile and history. Wolverine remembers enduring extreme pain while floating in the isolation tank of Experiment X. In the far future, Logan remembers the Weapon X experimentation as doctors comment that he will have no memory of the procedure. Logan vividly remembers as well that he is referred to as Logan when the experiment begins. Because this is a tale from the future, there is no way to ensure these events will happen, so any references to Logan’s past are suspect. As the adamantium bonding process wraps up, the Professor contacts his mysterious superiors and complains that he was not informed that Logan was a mutant with superhuman power to regenerate damaged tissue. In a story that takes place in 1981, Professor Charles Xavier helps Wolverine to remember his past. 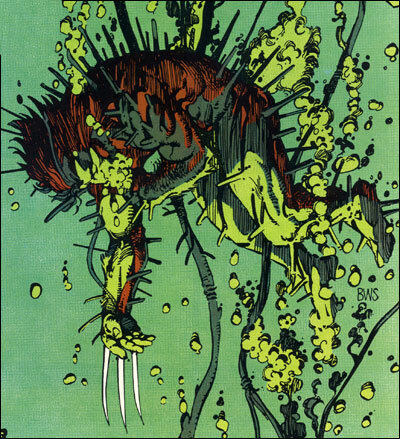 After a series of memory flashes, Wolverine confronts a memory of floating in an isolation tank at Experiment X. Continuing from 1981, Wolverine witnesses memories of receiving his adamantium skeleton, specifically the Professor returning to the lab at the behest of Dr. Cornelius to see the completion of the adamantium bonding process. The Professor again leaves as the isolation tank is drained, while Dr. Cornelius and Carol Hines discuss the nature of Logan’s recuperative powers. With the tank empty, Logan comes to and attacks the lab workers who quickly subdue him. Dr. Cornelius advises Hines not to mention the disturbance for the Professor is not one to tolerate mistakes. Later, Carol Hines returns to leave a plate of food for Logan and bursts into tears at his inhumane treatment. In the recovery room, Logan unwittingly “pops” claws from the backs of his hands, three retractable nine-inch adamantium knives housed within each of his forearms. The Professor coaxes a new Experiment X worker to check on Logan, resulting in a confrontation that sees the worker cut to ribbons within seconds from Logan’s razor-sharp claws. While fighting Sabretooth in the long abandoned Experiment X complex, Logan remembers emotions the first time he used his adamantium claws, the blood and the carnage. Logan is returned to the isolation tank as the Professor reviews his vital signs. Sabretooth watches and taps on the glass of the tank, agitating Logan within. A mysterious figure, revealed as Romulus, chides Sabretooth and expounds on the revolutionary nature of this genetic experiment, revealing in the process that this experiment would not exist without him. As he turns to leave, he orders the Professor to wipe Logan’s memories of these events. We return to the far future, as Logan again remembers the Weapon X experimentation. The Professor comments to a visiting General that Logan will have no memory of the experiment and then orders Hines to pop Logan’s claws. Because this is a tale from the future, there is no way to ensure these events will happen, so any references to Logan’s past are suspect. Wolverine tells Harry Leland of the Hellfire Club that he almost became a cyborg himself. This is probably a reference to his Experiment X experiences. I hate how the Adamantium became less and less rare in the Marvel Comic Universe. Now everyone and their mother has Adamantium weapons and spare parts. What happened to the fact that it was extremely hard to come by? Remember when Logan had to remain without Adamantium because no one could find the stuff? when did he get it put back in his body,after Magneto ripped it out?or did it ever happen? Hi this site of your blog was very helpful for me. But it was difficult to find it with yahoo. Maybe you should improve it with seo plugins for wordpress like headspace. the first pic,are those spikes coming out of him and what are they?i have had an old wolverine trading card that has him basically naked except for those wires and mechanical boxes and lotsa of spikes coming out of him and could never figure out what they were,i always thought they were spikes of adamantium due to his body trying to reject it or somethin,please help! I have also wondered about the spike imagery both in Barry Windsor Smith’s “Weapon X” during Logan’s testing phase, and again in Silvestri’s “Dreams of Gore” where these same spikes appear in Logan’s memories of Weapon X experimentation and other clandestine activities. Other than perhaps a representation of fragmented thought, what are the spikes? What do they signify? I think that the spikes are to represent the inner pain of having something seriously painful done, that you wouldn’t be able to see visually. Thank you for your comment. It’s kind of what I thought and makes visual sense in that light, but I had never seen anyone address this issue.